Barry Crump, MBE (15 May 1935 – 3 July 1996), was a New Zealand author of semi-autobiographical comic novels based on his image as a rugged outdoors man. Taken together his novels have sold more than a million copies domestically, equating to one book sold for every four New Zealanders. Crump's 1986 work Wild Pork and Watercress was adapted into the 2016 Taika Waititi film Hunt for the Wilderpeople. Born John Barrie Crump in Papatoetoe, Auckland, Crump worked for many years as a government deer-culler in areas of New Zealand native forest (termed "the bush"). He wrote his first novel, A Good Keen Man, in 1960, based on his experiences as a government hunter. It was a fictional account of a young hunter who has to suffer through a series of hunting partners who are often unsuitable for the job. This novel became one of the most popular in New Zealand history, and Crump’s success continued with Hang on a Minute Mate (1961), One of Us (1962), There and Back (1963), Gulf (1964), A Good Keen Girl (1970), Bastards I Have Met (1971), and others, which capitalized on the appeal of his good-natured itinerant self-sufficient characters and an idiomatic "blokey" writing style that he developed after his first book. Crump travelled throughout Australia (where he hunted crocodiles), Europe, Turkey, and India, the result of which was his conversion to the Bahá'í Faith by 1982. He married five times, including a one-year marriage to the poet Fleur Adcock and a twelve-year marriage to Robin Lee-Robinson, and had six sons.In 1988 Crump nearly died from accidentally inhaling cyanide when trapping possums. One of his sons, Martin Crump is now a well-known radio broadcaster. 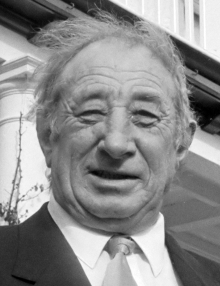 Crump was also well known for appearing in a series of acclaimed New Zealand television advertisements for Toyota’s four-wheel drive cars, which relied on his image as a stalwart "bushman". The ads aired between 1982 and 1995. He played an archetypal Kiwi bloke in the 1964 New Zealand film Runaway. Crump's song, "Side By Side", featuring his "sidekick" Scotty (broadcaster Lloyd Scott), was used as the theme song for Team New Zealand in the America's Cup. He was awarded an MBE for services to literature in 1994. Crump died in 1996 of a suspected aortic aneurism. At the time of his death he was living at Ohauiti with his wife Maggie. ^ Tony Reid (20 November 1982). "'Crump Flags It Away'—Profile of Barry Crump, a New Zealand Baha'i". New Zealand Listener. Wellington, N. Z.: 21–22, 25, 26. ^ "Barry Crump's good keen family". Close Up / Stuff.co.nz. 28 October 2009. Retrieved 19 February 2012. ^ "About Barry". barrycrump.com. Retrieved 19 February 2012. ^ Lee-Robinson, Robin (2004). In Salting the Gravy: A Tale of a 12 Year Marriage to Barry Crump. Robin Lee-Robinson. p. 201. ISBN 0476002443. ^ "Crump, Martin". New Zealand Book Council. Retrieved 27 July 2010. ^ "No. 53528". The London Gazette (Supplement). 30 December 1993. p. 34. ^ NZPA (5 July 1996). "Crump still had goals - wife". The Press.